This could possibly be my first fashion post. My Husband recently found me a pair of shoes online he thought I would like. I thought they were cute so he bought them for me. 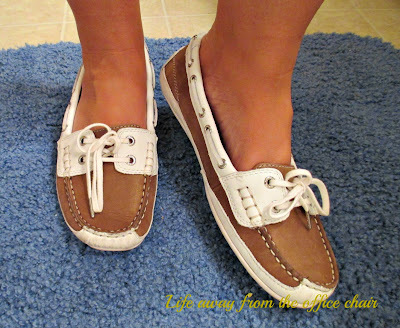 They are Sebago brand loafers. Perfect for the beach. I have been looking for some loafer / moccasin type slip-ons that can be worn with shorts or jeans. 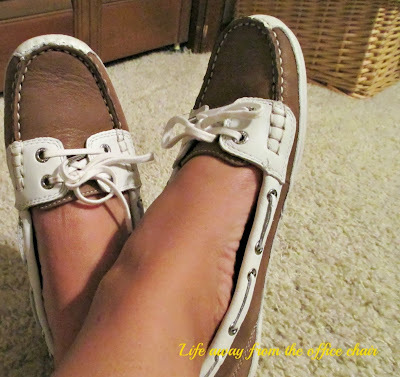 I have worn these a lot and I'm loving my "Bala" shoes by Sebago. While looking online, I found the Sebago site and decided to see what other shoes they have......Ok, honestly, I was just trying to find the ones like mine and see what they really cost. ha! These must be her favorite shoes! I have always admired Kate's simple elegant styles. After I saw this I immediately told my husband "you bought me princess shoes!" Mine are slightly different in color but still the same. Now if I could just find some of those outfits. Those are really cute :) They looks comfy too!